G–Walk uses a wireless inertial sensor which connects using Bluetooth technology to a computer. The inertial sensor is placed into a belt an placed around your waist allowing free movement of the patient to walk anywhere. The system can also be used in the same way to analyse running patterns. This information can be useful when assessing pre-and post-treatment outcomes and can often help a patient work towards rehabilitation goals. 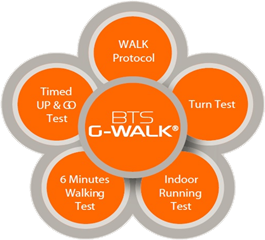 G-WALK is a reliable approach to movement analysis: a special sensor is applied to the individual being assessed which enables us to perform clinical tests such as the “Timed Up and Go” and the “6 Minutes Walking Test” efficiently, this supplies the most relevant parameters related to walking running and jumping. The data, which is essential in rehabilitation, helps therapists and specialists to assess patient’s condition and determine the efficacy of treatments and/or rehabilitation therapies. G-WALK can supply a fully comprehensive data that is needed for the clinical analysis of a patient in a few seconds. Optogait allows the practitioner to objectively assess the a patients physical, postural symptoms and any gait related asymmetries which may also affect postural and muscle balance. This information is observed and recorded using video and data obtained from the footage which generates a comprehensive report. This allows the clinician to apply a therapeutic rehabilitation intervention and or devices or furthermore orthopaedic solution based on the presenting problem. Optogait can further be used to prevent any reoccurrence of complications and can be used as a baseline to measure the efficacy of the rehabilitation package.